Yakuza 6 may look like a game about punching faces and throwing bikes and eating pudding and Beat Takeshi, but it’s actually a game about Haruto, a very good little baby. 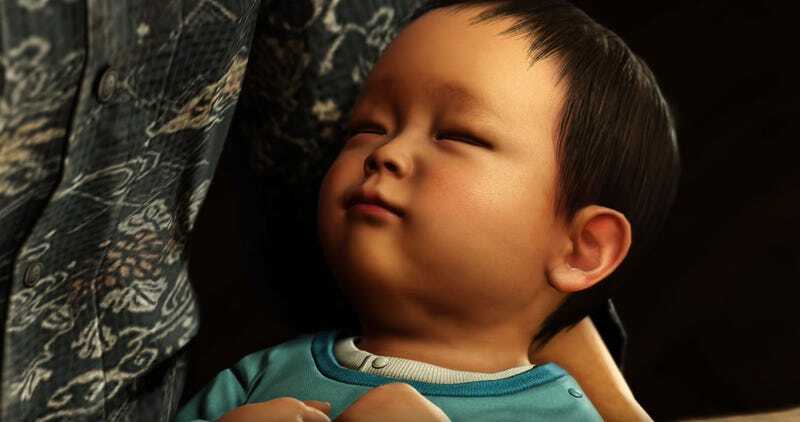 This squishy dude is at the very centre of the events of Yakuza 6, as criminal secrets and intrigue swirl around his obliviously fat cheeks, but I’m not here to talk about how Haruto fits into the story. I just want to talk about how he’s the best video game baby. Think about babies in video games. How often do you see them? Not often. And when you do, how often do you see them painstakingly animated and portrayed as actual babies, and not just props that you need to protect or see in cutscenes? Almost never. Video game stories are for angry people with guns, not tiny humans with squishy fingers. Haruto, though, is a true video game baby. As often as he’s an inanimate burden (there’s a section of the game where you literally have to lug him around) he’s portrayed as the embodiment of potential. For every time you comically hand him off to a stranger before a streetfight—which happens—there are tender scenes where he’s being laid down for a nap, or nursed gently on someone’s lap. For a series that’s made its name with bar brawls and flying scooters, it’s a hell of a sight to see grown Yakuza speaking in hushed tones so they don’t wake up a baby. What really makes Haruto stand out, though, is just how “real” he is. I know the Yakuza series does this to everyone, it’s one of the reasons the game’s stories and characters resonate so deeply with fans, but it’s almost shocking how detailed and nuanced Haruto’s animations are. “Hot damn”, I thought the first time I saw his little hands grasping at an adults, his chunky legs flailing about in the air, “that is actually a baby”. The quality of his animation, and his “goos” and “aahhhs” and tiny flailing limbs aren’t just for realism’s sake, either; they also got me a lot more inspired to protect him from his enemies than I would have been were he just some inanimate lump of polygons. Yakuza 6 may feature Kazuma Kiryu and Beat Takeshi, but Haruto is the star of this game. The game is subtitled Song of Life for a reason, and the way his lineage and helplessness gets the normally stone-faced Kiryu pondering his place in the universe (and changing nappies, and trying to find baby formula) is one of the deftest narrative turns this series has ever pulled. Kiryu’s heart is melted by this little guy, and I have to say that mine was as well. For a series about crime drama and brutal combat, it’s a welcome change to walk away from a Yakuza game remembering a cute baby as much as an epic fight scene.